A rhubarb chicken race report. I’m going to mask a lackluster race report in chicken. Rhubarb chicken salad to be specific. Both the sandwich and the race happened three weeks ago. They are way too old now, but I’m going to tell you about them anyway. I did Point to LaPointe a two mile swim in Lake Superior from Bayfield to Madeline Island. We stayed in the city campground just a 1/2 mile walk into town so we could park the car and forget about it. The day before we swam in Superior. I could have been actually swimming but I went treasure hunting instead. I found sunglasses and a golf ball hiding in the rocks about six feet down, which is at least four more feet of visibility than Lake Nokomis. As for the race itself… I liked the challenge but I still have a lot to learn about swimming in bigger water. I lost another tempo trainer. We were all treading water waiting for the start. I swear the tempo trainer had be securely tucked up in my cap but suddenly the beeping stopped. I went under and heard it beeping. I looked around franticly as the beeping got fainter and fainter, then nothing. Another sacrifice to Poseidon, or Mr. Kitty Nibbles. I never saw one of the three (or four?) buoys out there. All I ever saw was the white smoke from the fire at the finish. Maybe that was because I was so far off course. I underestimated the effects of a cross current. About half way the current running perpendicular to the course (parallel with the long island) really picked up strength. At least I wasn’t alone, many people got pushed into swimming a very long arc. My time was ok, but I’m not particularly thrilled with it. “Two” miles in 1:05.44, which is a 1:42/100y pace. I’m always a little disappointed with my open water swim times because I’m so much faster in the pool. It’s the walls, I’m good with walls. But if you figure I swam maybe a 1/4 mile more than necessary… that would be a 1:31 pace, which is closer to what I can do in the pool. If I swam a 1/2 mile more that would be a 1:22 pace and I’d be thrilled. So the take away is that I need to be stronger in swimming in a cross current, and without walls. After the race we spent the rest of the day on a friends sailboat in which we were having too much fun to take any pictures. I did some more swimming off the boat. I swam laps around the boat. I swam under the little boat. I’ve learned that I LOVE swimming in lake superior (at least in relatively warm waters). It’s so clear! And all the big scary fish are not generally near the surface. Our view of the lake after a long day out on it. Now back to the good stuff. 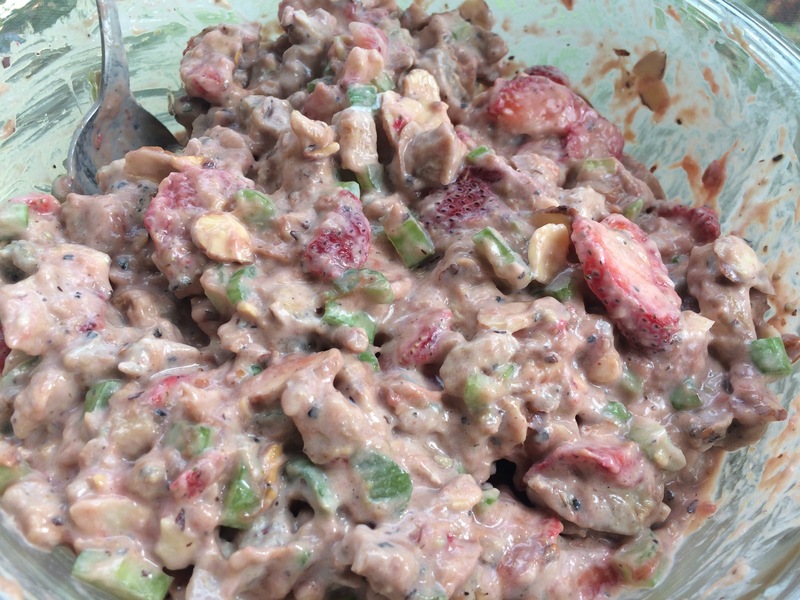 One of the things we brought to eat was rhubarb strawberry chicken salad sandwiches. I strongly recommend it, probably more than swimming. Although I didn’t measure anything so I’m giving you about as much guidance as I got in the swim. I cooked a quart sized bag of rhubarb (from Andrea’s garden) in the juice of one orange and a whole bunch of honey. Kept it simmering until it was a thick jam. I cooked some chopped chicken (two large breasts?) in a lot of black pepper and rosemary powder. I mixed about 5oz of plain greek yogurt with some chopped up strawberries, celery and toasted almond slivers (which I had toasted before frying the chicken as to not dirty another pan). Then I mixed the yogurt salad stuff with the chicken. I added enough rhubarb jam for it to look like crap and taste delicious. It’s excellent between any type of bread and then you can’t see how bad it looks. 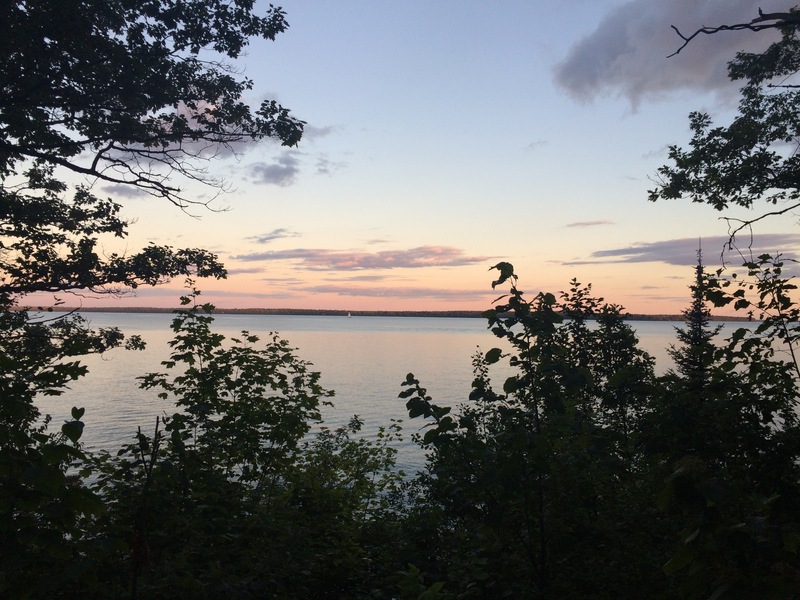 This entry was posted in Fitness, Kym Cooked and tagged chicken salad, Lake Superior, lake swimming, Point2LaPointe, race report, rhubarb. Bookmark the permalink. 3 Responses to A rhubarb chicken race report. Nicely written, Kym. I wouldn’t feel too bad about getting off course in Superior. I can do that just coming back to my dock.